Hello everyone, I hope you are all having a wonderful weekend! 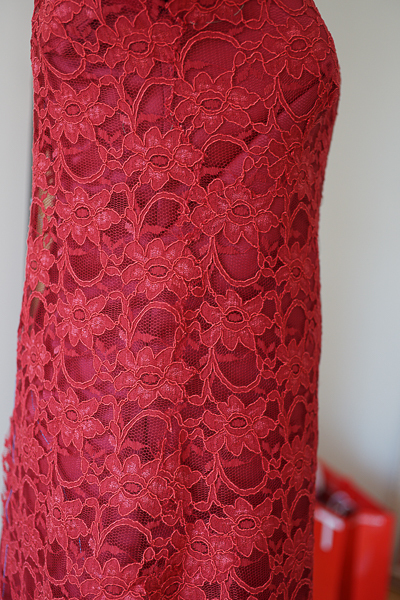 1) I have finally tackled one of my biggest fears when it comes to sewing...working with lace. And boy, did I throw myself into the deep end with this one! 3) This is my first White Tree Fabrics Blog Team make! I wanted to give this stunning piece of heavy corded lace the attention it really deserves, and that could only mean one thing - appliqué seams. Yes, it is time consuming, but I adored the all over, seamless look that's often seen on couture lace dresses. Can you spot the dart and the side seam? I also love the scalloped selvage of the lace, and used it everywhere -- I made sure the pattern was cut so that the hem falls onto the selvage to minimise the hand stitching. The pattern is McCalls 6505, which I have had in my stash for quite some time. I love the design, and the photo on the envelope, but have read mixed reviews on the instructions. And they were right of course, as the steps described were pretty confusing! Thankfully, though, since I was using appliqué seams, I needed to change the steps anyway. So I spent hours checking all my sewing reference books, and searching through the internet, to come up with a plan that would work for my dress. Here's the nerdy part. I've summarised the key steps I went through, in case it helps anyone else who has been looking at attempting this pattern, or making a similar dress. Firstly, the terminology. I'm going to call the lace layer, er, lace, then the duchess satin as "underlining", and the cotton lining the "lining". 1. After making a toile of the lining, I took in at the waist, chopped off some length, and made the slashed side dart into a full, overlapping dart. I also transferred these changes to the pattern for the lace layer. 2. Making the underlining, and the lining layers, leaving the centre backs open. 3. 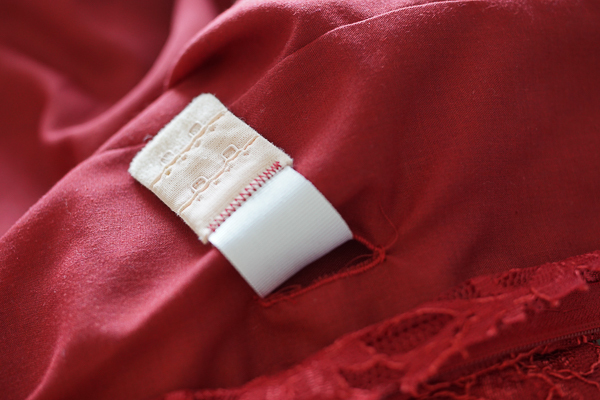 Attaching the underlining to the lining at the top/neckline, across the entire top edge. Understitch. 4. I also made a waist stay, to take some of the weight off the shoulders... literally! This was attached to the lining layer (i.e. sandwiched between lining and underlining), and brought through the lining via buttonholes. 5. Thread trace the pattern pieces on the lace, including the marking for the darts. If I were to do this again, I would thread trace the actual stitching line, as opposed to the cutting line, i.e. I would exclude the seam allowance. 6. Take great care cutting around the thread, allowing full motifs outside the thread markings. I would say this was the most crucial step in the whole project. 7. The appliqué seaming begins! Here's a photo of the side dart with the basting and pins. I took my time with the hand stitching here, ensuring continuity of pattern where possible. 8. I then tried stitching the side seams with a narrow zigzag on my machine, as a shortcut to doing the appliqué seaming. It wasn't the smoothest experience, because the heavy cords often got a bit stuck in the feed dog, but I went slowly and it worked ok.
9. I drafted the cap sleeves, rather than using the ones from the pattern, because I wanted to take advantage of the scalloped selvage. 10. Time for more hand stitching... to attach the sleeves. 11. I cut a strip of selvage from the remaining fabric, and hand sewed it to the neckline, going from centre back to centre back (via the front! ), and also "finished the arm cycles (the portion not covered by the cap sleeves) the same way. 12. After trying the layers on together, I hand basted the lace to the underlining at the centre front and underarm side seams. 13. I took all three layers together at the centre back, and handpicked the zipper through all layers. Finish the portion of all layers below the zipper. 14. I then made some covered snaps with the lining fabric, and sewed two pairs at the top of the centre back to the lace. 15. Finally (! ), I hemmed the underlining so that it hangs above the scalloped lace hem, and then the lining so that it is even shorter and is invisible when worn. Needless to say, it was a time consuming project. This wasn't my usual "weekender", but it was much more rewarding. I was finally ready to attempt working with lace, and I am really pleased that doing this the couture way has worked out well. I must admit though, this was possibly the messiest project that I have ever done! All that thread tracing, snap covering, pins that slipped through the net (yep!) and of course trimming off the excess lace from appliqué seams... My sewing room is a complete mess, and I keep finding red fluff everywhere in the house, and on our clothes... I'm pretty sure that I'm not the only person who's pleased that this project is finished! 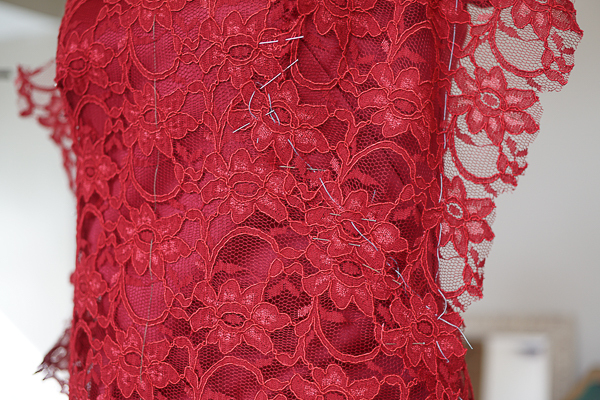 Now over to you - do you sew with lace? Any tips to share? Spectacular! Red suits you well and all your hard work was so worth it. A knockout dress! Absolutely gorgeous and your seams are amazing! Love this colour on you too. I'm still tackling silk. Thank you! The seaming did test my patience but I'm glad we got there. Silk is a pleasure to work with... unless you are using one of the lightweight varieties like habotai... Good luck! Absolutely beautiful dress Alice! It suits you perfectly. Thank you so much Lisa for your kind words and also for the beautiful, beautiful fabrics (and zip)! Dress is fantastic. I love it! What a fabulous dress and it looks stunning on you. It was well worth all the effort. I love that you chose red, it such a luscious colour. You are too kind, Sandra! I'm glad I faced my fear and though I don't think I'll be seaming lace again any time soon! Gorgeous! I'm really impressed with your patience. Many thanks Renee! It took sooo long but I'm glad it's finished! Gonna try something simpler next, I think! This is gorgeous! You did a wonderful job. I haven't worked with lace yet but it is on my list. So beautiful! Looks great on you and well done for tackling lace. I'm still quite far away from attempting it! Gorgeous dress! The red is a great color on you. Thank you Linda! I do have a soft spot for red! Beautiful dress! You did a wonderful job! Stunning! I've never sewn with lace, but your dress makes me want to!